Have you driven a 2018 Mazda MAZDA6? 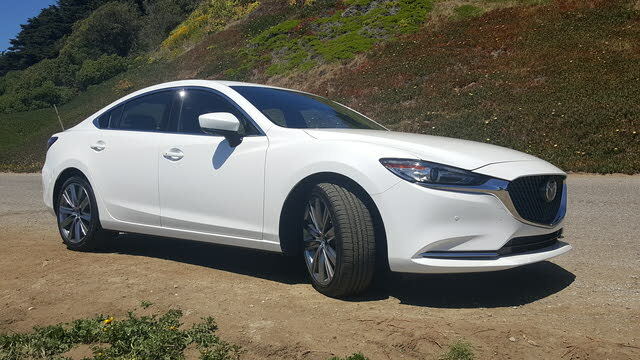 Displaying all 7 2018 Mazda MAZDA6 reviews. Handling Ranked 2018 Honda Accord better. "Sport trim has no equal in the class. Can give a gti a run for your money and haul people on a trip comfortably"
Value Ranked 2018 Honda Accord worse. "With Napa leather and 360 camera available for under 36k and the fit and finish to rival a luxury car this should be top of your list for a near luxury experience." MSRP: $23,800 Invoice:$22,594 Search Mazda dealers to find exactly the car you want. Fantastic family sedan. A little more engaging to drive than most competitors (looking at you, Kia). Upscale interior and very refined ride. The discounts Mazda offers are usually excellent as well leading to feeling like you got an almost entry level luxury car for the price of an economy sedan. Gas mileage has been well north of 30 for the non-turbo 2.5L engine. Great car. Handling Ranked 2018 Honda Accord Hybrid EX worse. "I felt more in touch with the road. it handled better, the ride was more firm"
Cargo Capacity Ranked 2018 Honda Accord Hybrid EX better. "The trunk was slightly larger"
Looks/Style Ranked 2018 Toyota Camry L worse. "Value for money, engaging car. has the same level of comfort and sound proof as camry." Value Ranked 2018 Toyota Camry L worse. "Everything! The design is one notch up!" Good looking and roomy. Not great acceleration, but nimble and grea t cornering with active suspension. Well designed and classy. Had some issues with computer system. To much electronic equipment. Looking for a Used MAZDA6 in your area? CarGurus has 9,311 nationwide MAZDA6 listings starting at $1,494.